You love to cook, but every night? No way! On the other hand, you don't want to eat out or have frozen pizza. On the weeknights you don't cook, you want something delicious — a balanced meal with quality ingredients. Come to think of it, what you really want are fresh, home-cooked meals made by somebody else, delivered! Welcome to co-op cooking, possibly the best idea since Pyrex with a lid. With dinner at your door, you'll see how to cook one fabulous dinner a week and have two or three equally sensational meals delivered to your door, hot and ready to eat. If you love to cook but the pressure of doing it every night gets you down, a dinner co-op is for you. Instead of slamming together three or four 30-minute dinners a week, you can take your time crafting one superb weeknight meal and enjoy receiving the other meals automatically. 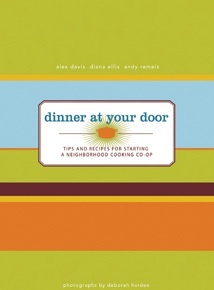 Dinner at Your Door provides information you need to set up your own dinner co-op, along with more than 60 recipes specially developed for co-op cooking. These dishes offer the perfect starting point for meals that can be made ahead of time, that travel well, and that won't dry out after drop-off. Dinner at Your Door takes your average weeknight dinner from a grind to gourmet.